Red Flags Handout: Free Handout! Download this FREE checklist to find out! Enter your name & email to have this handout delivered straight to your inbox! SEND ME MY FREE HANDOUT! What Exactly Are The Red Flags In A Relationship? You may be fully aware of what the red flags are in your relationship or they could be hiding in plain sight! Whether you've been exclusive for a while or you're going on your first date, be aware of the red flags! 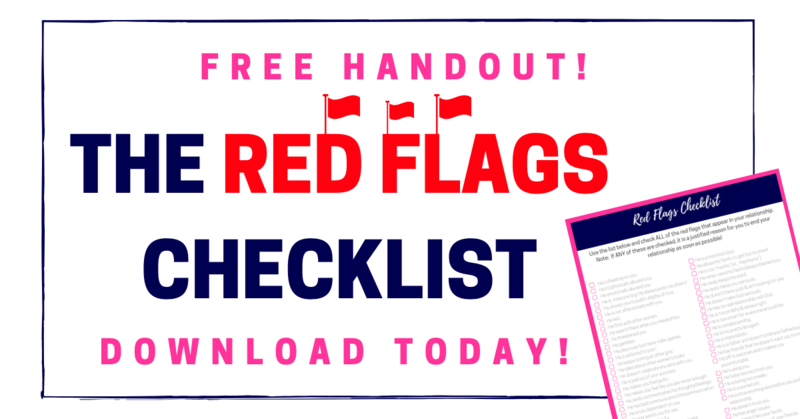 Download this FREE handout to get a complete checklist of the relationship red flags that you should run away from! Sign Up To Receive The RED FLAGS Checklist In Your Inbox Today! Your Handout is On Its Way! Be sure to double-check your spam folders & promotions tabs in case it went in there! Fall In Love with a Few More of My Resources! While you're waiting, share this test with your friends! !